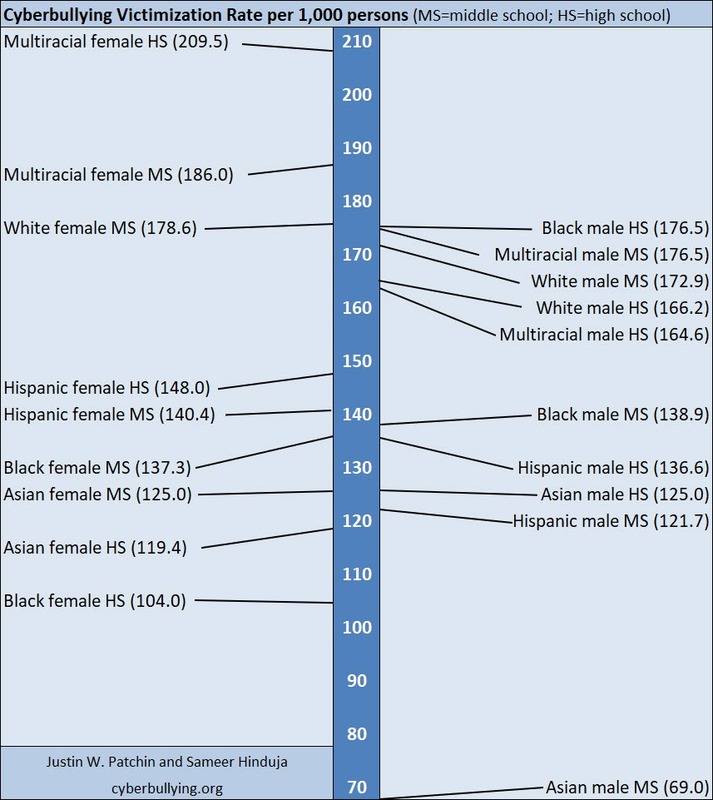 This study surveyed a nationally-representative sample of 5,700 middle and high school students between the ages of 12 and 17 in the United States. Data were collected between July and October of 2016. Click on the thumbnail images to enlarge. 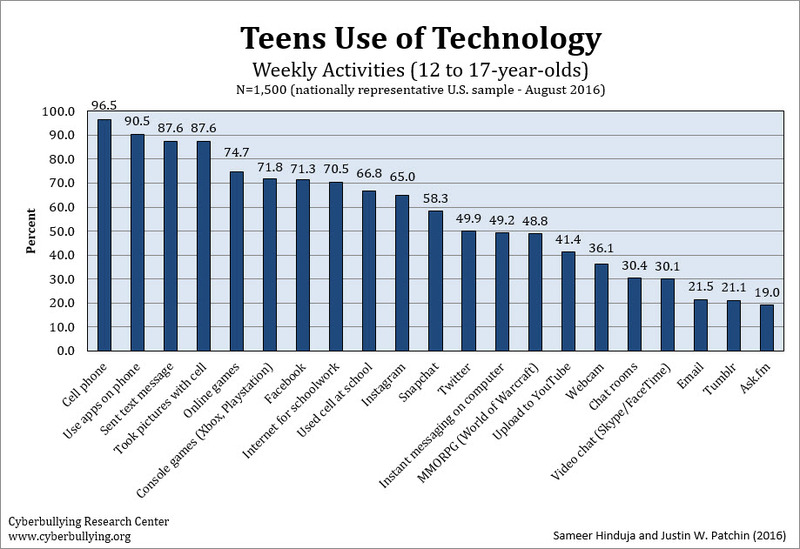 Teen Technology Use. 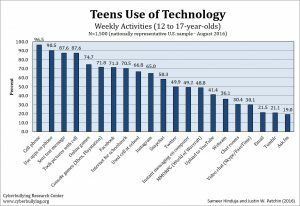 Cell phones and other mobile devices continue to be the most popular technology utilized by adolescents with the top four reported weekly activities involving their use. Facebook remains the most frequently cited social media platform used on a weekly basis, but Instagram and Snapchat are increasing in popularity. Chat rooms, Tumblr, and Ask.fm remain largely unpopular among this age group. 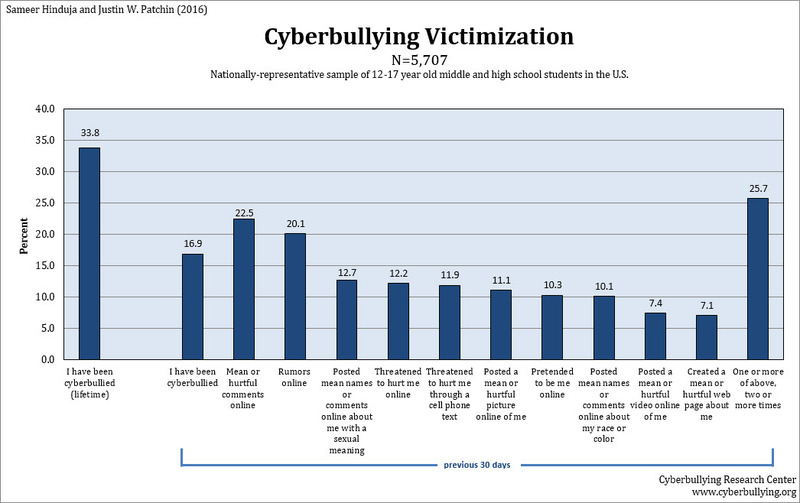 Cyberbullying Victimization. We define cyberbullying as: “Cyberbullying is when someone repeatedly and intentionally harasses, mistreats, or makes fun of another person online or while using cell phones or other electronic devices.” Approximately 34% of the students in our sample report experiencing cyberbullying in their lifetimes. When asked about specific types of cyberbullying experienced in the previous 30 days, mean or hurtful comments (22.5%) and rumors spread (20.1%) online continue to be among the most commonly-cited. 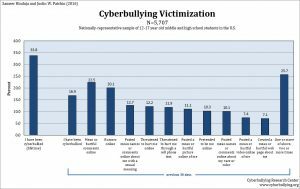 Twenty-six percent of the sample reported being cyberbullied in one or more of the eleven specific types reported, two or more times over the course of the previous 30 days. Cyberbullying Offending. We define cyberbullying as: “Cyberbullying is when someone repeatedly and intentionally harasses, mistreats, or makes fun of another person online or while using cell phones or other electronic devices.” Approximately 12% of the students in our sample admitted to cyberbullying others at some point in their lifetime. Posting mean comments online was the most commonly reported type of cyberbullying they reported during the previous 30 days (7.1%). About 8% of the sample reported cyberbullying using one or more of the eleven types reported, two or more times over the course of the previous 30 days. 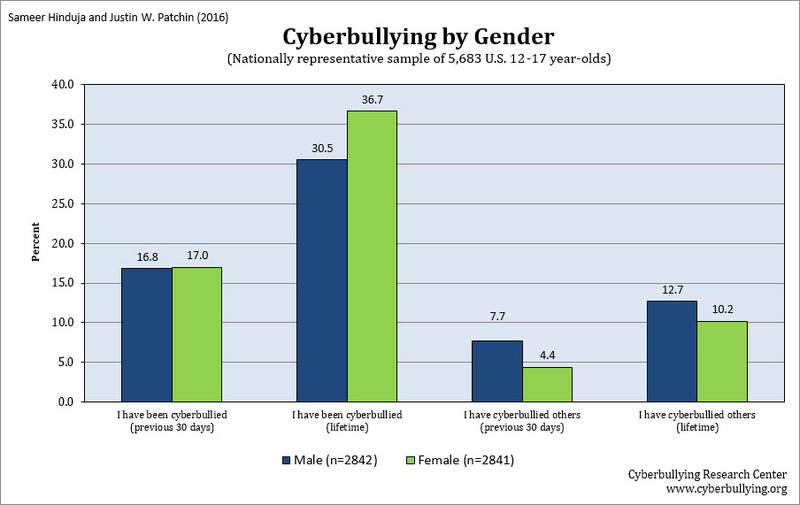 Cyberbullying by Gender. Adolescent girls are significantly more likely to have experienced cyberbullying in their lifetimes (36.7% vs. 30.5%). This gap narrows when reviewing experiences over the previous 30 days. In this sample, boys were significantly more likely to report cyberbullying others during their lifetime (12.7% vs. 10.2%) and in the most recent 30 days (7.7% vs. 4.4%). The type of cyberbullying tends to differ by gender; girls were more likely to say someone spread rumors about them online while boys were more likely to say that someone threatened to hurt them online. 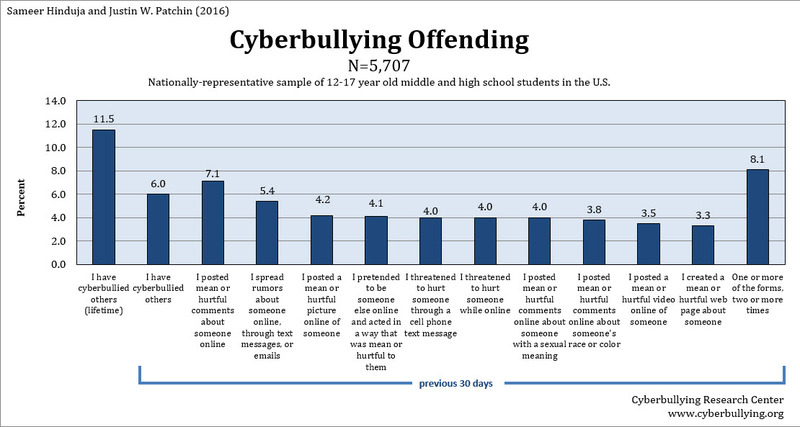 This was the first sample we have collected where boys reported significantly more involvement in every type of cyberbullying offending behavior we asked about (results not shown in the chart). In the past, this has varied by type of behavior. For this study, we contracted with three different online survey research firms to distribute our questionnaire to a nationally-representative sample of middle and high school students. We had four different versions of our survey instrument which allowed us to ask a variety of questions to subsamples of each group. All students were asked questions about experiences with bullying and cyberbullying, digital dating abuse or violence, digital self-harm, sexting, and sextortion. Overall we obtained a 13% response rate, which isn’t amazing, but is higher than most generic Internet surveys. With any imperfect social science study, caution should be used when interpreting the results. We can be reassured somewhat in the validity in the data, however, because the prevalence rates are in line with results from our previous school-based surveys. Moreover, the large sample size helps to diminish the potential negative effects of outliers. Finally, steps were taken to ensure valid responses within the survey instrument. For example, we asked the respondents to select a specific color among a list of choices and required them to report their age at two different points in the survey, in an effort to guard against computerized responses and thoughtless clicking through the survey. We want to thank the Digital Trust Foundation for funding this study. Patchin, J. W. & Hinduja, S. (Forthcoming). Sextortion Among Adolescents: Results from a National Survey of U.S. Youth. Online First in Sexual Abuse: A Journal of Research and Treatment. Hinduja, S. & Patchin, J. W. (Forthcoming). Connecting Adolescent Suicide to the Severity of Bullying and Cyberbullying. Online First in the Journal of School Violence. Patchin, J. W. & Hinduja, S. (2018). Deterring teen bullying: Assessing the impact of perceived punishment from police, schools, and parents. Youth Violence and Juvenile Justice, 16(2), 190-207. Patchin, J. W. & Hinduja, S. (2017). Digital self-harm among adolescents. Journal of Adolescent Health, 61, 761-766. Hinduja, S. & Patchin, J. W. (2017). Cultivating youth resilience to prevent bullying and cyberbullying victimization. Child Abuse & Neglect, 73, 51-62. 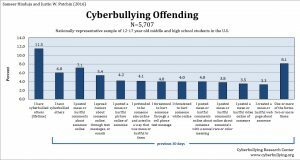 September 20, 2018 – Are “Gamers” More Likely to be “Bullies”? Does the bullying that goes on in the political arena more recently on twitter count as "cyberbullying" or is it acceptable because they are politicians? is there a correlation between the frequency of bullying and abuse/ and or neglect in the home of the adolescent who is the bully? This is something we have not yet studied. Hopefully a researcher in the field of social work can tackle this question, because like you, I think it&apos;s super important to look into.